No trips today so we get to explore our base city here on the Amalfi which is Sorrento. 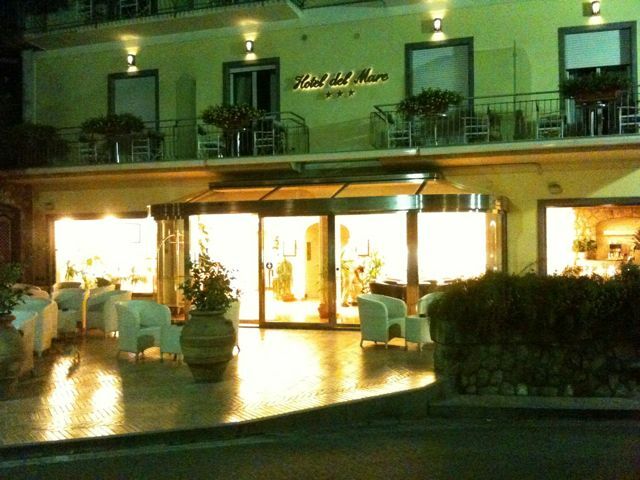 We are staying in the Hotel del Mare which is situated next to a sleepy harbour called Marina Grande. It's right at the outermost point of the city squeezed in between a cliff-face and the sea shore. Where we are is a nice, quiet and sleepy part of town which is not overrun with tourists and the locals are very friendly. We have a lazing morning planning to explore the centre of town and watch the Liverpool and Man Utd match at 2.30pm. It's a long uphill and winding walk and only one of us is up for that so the remaining three get the local bus which needs to be small in order to get around around some of the corners here. We spend the day wandering up the main streets looking at the highlights, like the cathedral and do a little window shopping. K sees a small little shop where they make and sell music boxes and the workmanship is fantastic. We plan to have a quick lunch and sit down in the square to watch the match when we discover that the match isn't until tomorrow, damn. 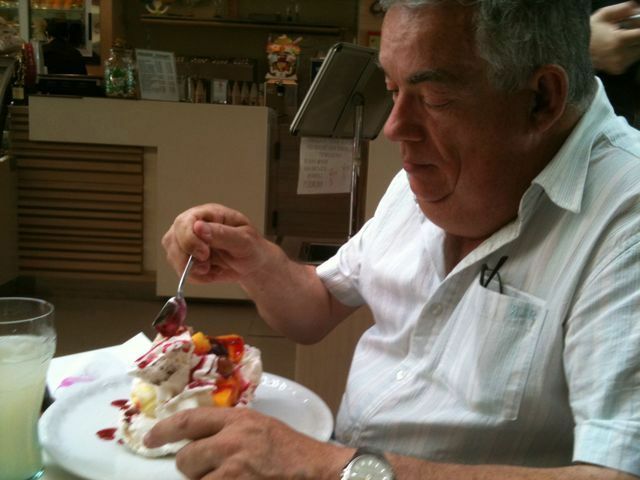 We get a little lunch and a huge ice-cream and meringue before heading back. Some more of the photographs are here. Massimo our driver from Sorrento Silver Star Car Services, arrived just after 10.15 am to take us on tour of the Amalfi Coast. Firstly I would like to say that everyone from the car service: Luisa, Lucia and Massimo were tremendous looking after us. We began by getting an excellent view over Sorrento from the road above. The drive along the coast is along a winding and in places very narrow road way. The day was also helped by the fact that the weather was brilliant, about 28c and sunshine all the way. Massimo stopped along the roadside at all the best viewpoints so we could take our photographs and video. 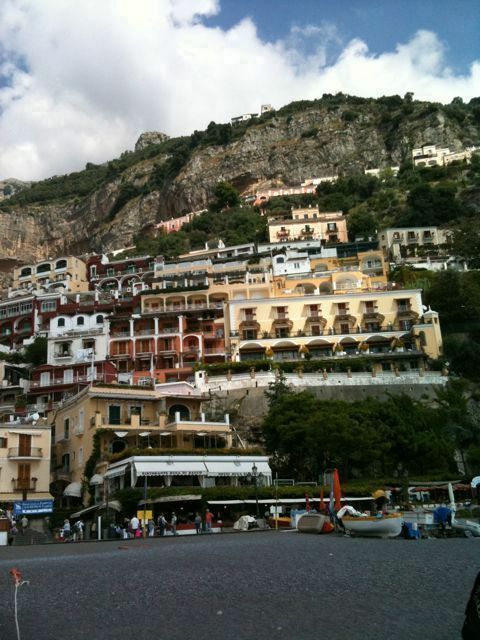 Positano was our first stop a beautiful town that slopes down the mountain side right down to the beach. After some photos from the road to get a panoramic view we headed down to the very busy little town. The narrow bustling streets lined with shops, boutiques, bars and cafes lead down to the stoney beach with boats and sun-worshippers. Our hour flew and we headed next to Amalfi, Massimo's home town. Along the way we had a short stop at the Emerald Grotto. An elevator takes you down to sea level where you then get in a small boat inside the cave dripping with stalactites. At one corner a beautiful blue/green light shines into the cave below the crystal clear water. This is a natural phenonamon caused by a breach in the cave wall below the water line that let's the sunlight shine into the cave. 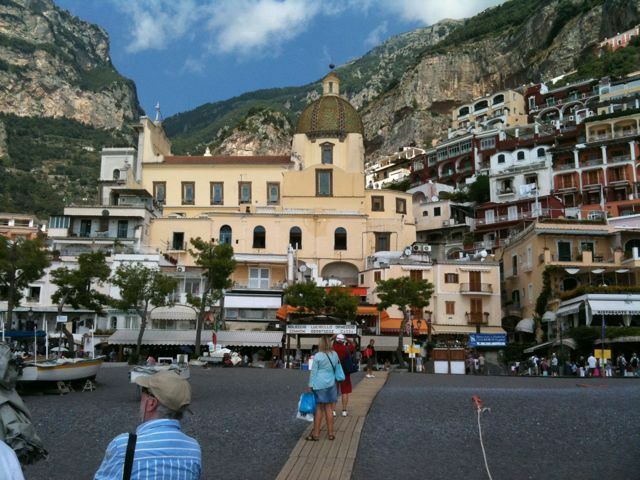 Amalfi is another lovely Coastal town but flatter and not as hard to walk around. We get an hour to explore and have a quick bite. Definitely a town I would consider basing myself if we come back here again with the family. Revello is our last stop about another 5km along. However, this is not a Coastal town but high up overlooking the coast. Again a winding narrow road is masterfully negotiated by Massimo and we are all delighted we are not driving. We spend another delightful hour exploring this town although some parts of the town required you to take some steep walks to fully appreciate it and at the end of the day this was beyond us, so we finished it off with a cup of coffee and tea in the lovely town square. It's coming up to 6pm and we've had another great day and Massimo brings us home. It takes an hour for us to get to the hotel. Hiring a car and driver is a great way to see the coast you take it at your own time and see the places you want to see, and we can recommend www.sorrentosilverstar.com and ask for Luisa. Capri a lovely island off the Sorrento peninsula inhabited by the rich and the famous "even the poor are rich here" says our guide, Gerry. But he also says that the only problem with Capri is that there are too many tourists and he's not wrong. We should have guessed this when the people were thronging to get about the hydrofoil. It only takes 20 minutes on the jet or hydro foils or 40 minutes on the ferry to get to the island. When you arrive on the island there at least a half dozen other boats disgorging their passengers that must number in the hundreds per boat. You are then met by numerous guides offering their services and minibuses to ferry you to one of the two towns on the island, Capri and Anacapri. 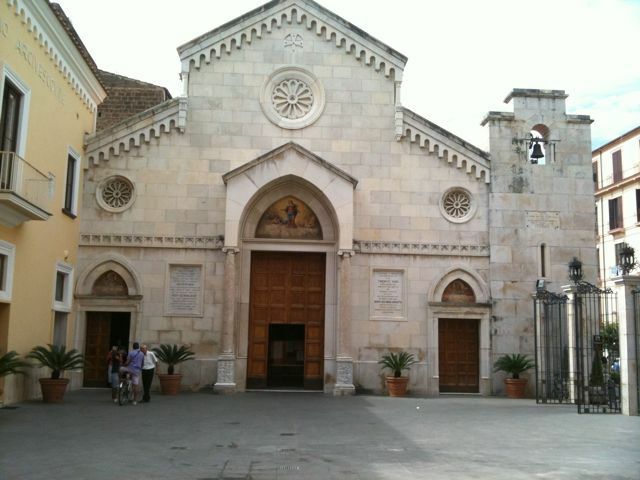 We start off with Anacapri. Our bus takes us up the narrow roads where you think the buses and cars would have to be smeared in butter in order to pass each other the road is so narrow and winding. 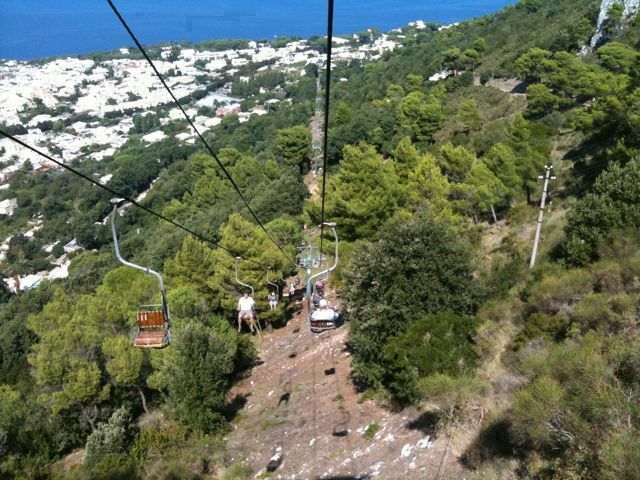 Our first stop is the chair lifts that take you to the top of Mt Solaro (589mt). Where you can get panoramic views of the island and the Bay of Naples. A quick look around, a cup of cappuccino and then we head back down. We have a nice light lunch of salad, pizza and ice-cream for a reasonable €15 before heading to the Town of Capri. This also is at a height overlooking the grande Marina. The town is full of expensive and named boutiques (Prada, Gant, etc). But it's difficult to just wander around and enjoy the ambiance due to the crowds. But the weather is beautiful and we head up back streets to get to see the place better. 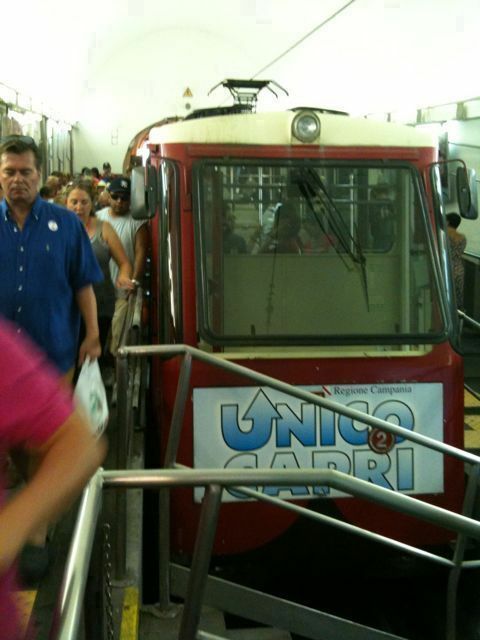 Time to head back and we take funicular train down to the Marina and out return boat. But even this takes an age as the queue for the train is huge and reminiscent of Disneyland. Finally we make it to the boat with a rush and now we are sitting here tired and falling asleep as we head back to out hotel. But another good day all the same. Video from the Chair lift. Luisa from our limo company, Sorrento Silver Star car services, suggested we take in Pompeii on the drive from the airport rather than return there another day which would save us both time and money. She also recommended an excellent guide Lucia whose knowledge of Pompeii and general Italian history was exceptional. We had a very good 3 hour tour of the ruins. It was amazing to see this city which was caught in a moment of time when mount Vesuvius erupted in the year 79 and buried the city in lava and ash. 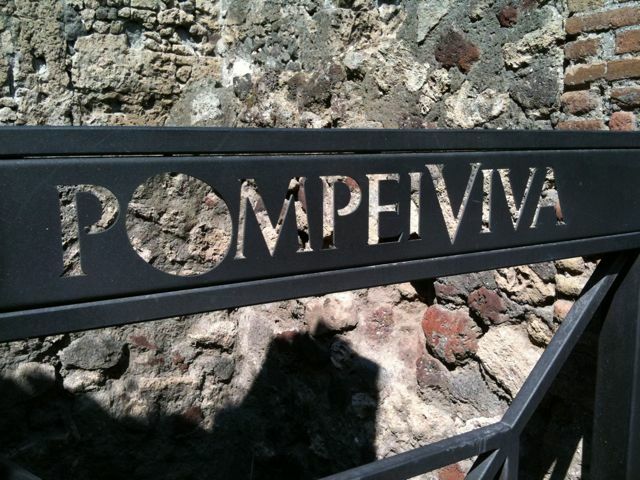 Pompeii was originally founded in the 7th or 8th century BC. It came under the rule of many different regimes. Touring Pompeii a number of different things strike you. Firstly and perhaps most obviously is the devastation caused by the eruption. People and animals are caught forever carved in the positions that they were at the time of the eruption and the agony and fear can be seen in their poses as they tried to protect themselves from the instant devastation that was forced upon them. You can see how they tried to breath in the all encompassing ash that was falling around them that was probably burning them and suffocating them at the same time. The city was covered in over twenty feet of ash that solidified over time and Pompeii was forgotten until more than 1600 years and excavations began to uncover the city. These excavations have gone on for over 150 years. 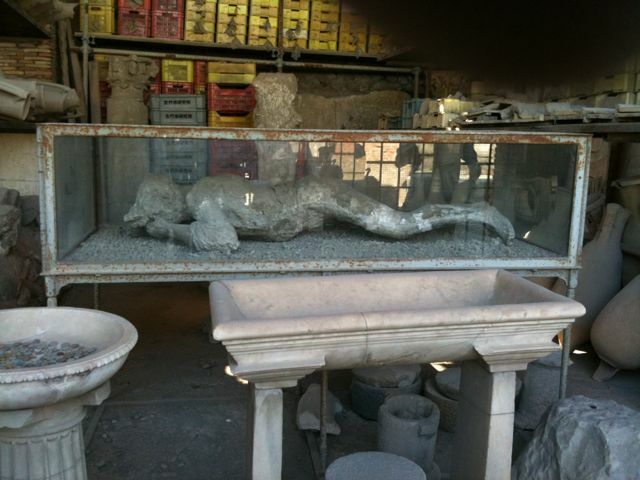 Many of the artefacts were stolen or are displayed in the museums in Naples or around Italy. However enough of the ruins and frescoes are left to show the majesty of the former city. What strikes you then is how sophisticated society and civilisation was at the time of the eruption. Beautiful houses and mansions, theatres, gardens, frescoes, pavings, aqueducts, sewerage systems, the baths, the forum, basilica, temples, hotels, shops, markets, brothels and the cobbled streets. The architecture and engineering was incredible and ordinary life was not all that different than today. There were traders, farmers, shopkeepers, slaves, soldiers, politicians, and even the equivalent of what you might call fast food restaurants. In fact you can see the counter tops where the food was stored and served from little shop fronts to those passing by. A truly amazing experience which was brought to life for us by our guide Lucia, thank you very much! 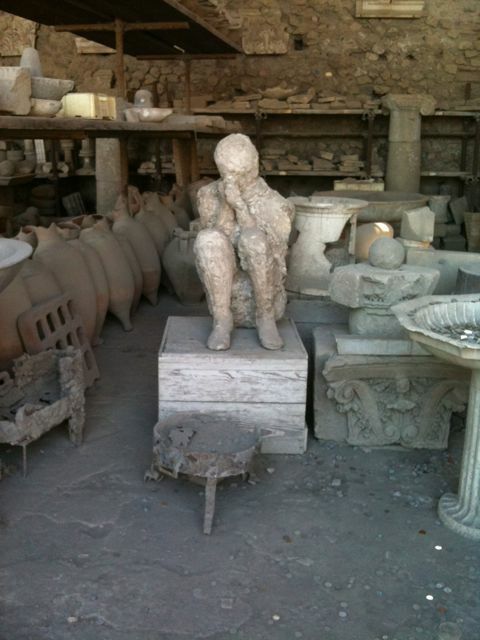 Some more Photos from Pompeii here. We're back on tour again all set and ready for another great adventure after the disappointment of having to cancel in May due to the volcanic eruption. Mind you we start with another volcanic eruption however this ones quite a bit older it's Pompeii. Up early and we meet at 5.30am so we get a full day when we arrive. Not a great start though as the flight is delayed 30 mins due to restrictions at Naples airport. 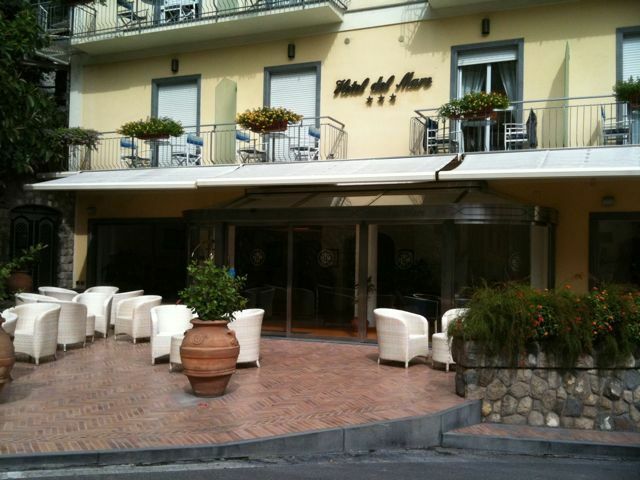 Our base will be in Sorrento in the Hotel del Mare near the marina. 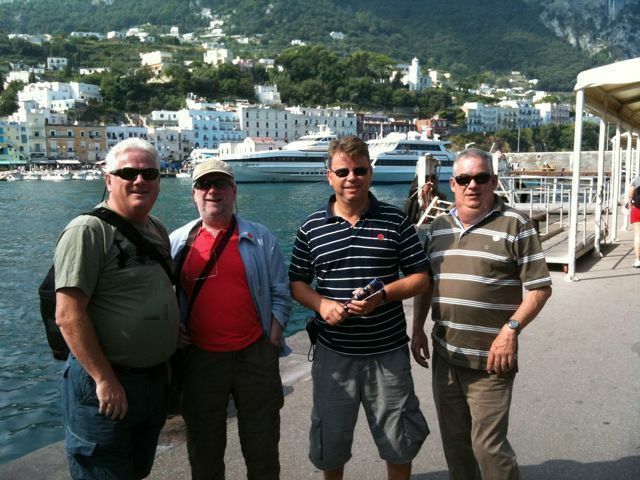 From here we plan to take the Amalfi drive along the coast and we plan a trip to visit Capri. It looks like the weather will be good, in the twenties, sunny and dry. We've booked a limo company to take us around and to do the airport transfers so that should mean we can just sit back enjoy it and take it at our leisure. We're here from Wednesday to Sunday so a good break plenty of time for sightseeing, relaxing, some good photos (I hope), good food, a few drinks and great company. Here's a trailer of the video to come!